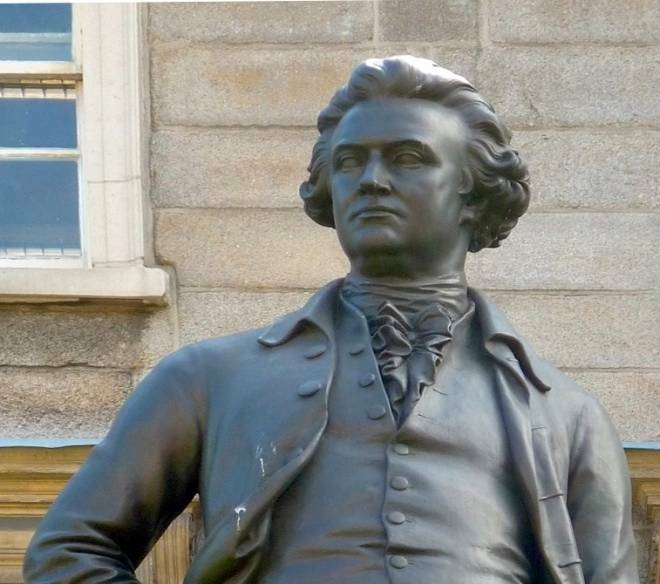 Edmund Burke, by John Henry Foley (1818-1874), R. A.
John Henry Foley (1818-1874), R. A.
Edmund Burke, the politician, philosopher and author, is seen here at his staunch and confident best: "[t]hroughout his life Burke's personal magnetism was an acknowledged, even overpowering force" (Langford). 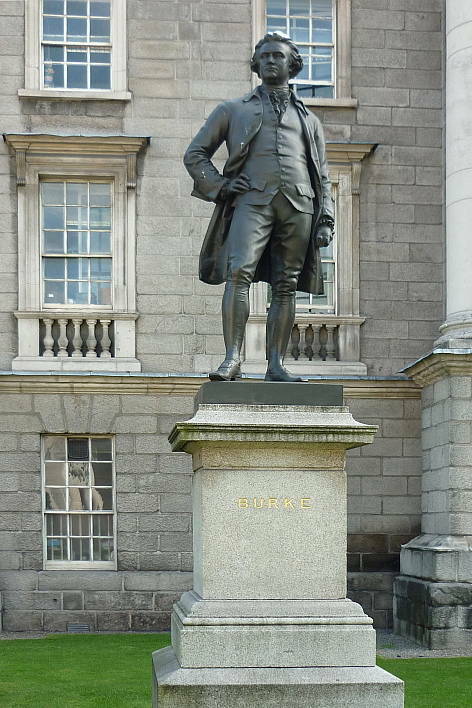 This is one of the two bronze statues by Foley on the lawns outside the main entrance of Trinity College, Dublin, the other being that of Burke's fellow-alumnus Oliver Goldsmith. According to Benedict Read, the universities "were prominent institutions in the patronage of sculptures. This could be simply a matter of placing a professor on record with a bust, or it could be a more substantial simulacrum of a noted alumnus or official" (123). Other fine sculptures grace the grounds, including (from a rather later period), Goscombe John's memorial to William Lecky, MP looking across the College's Parliament Square. Perhaps Foley's best-known work in Dublin is the O'Connell Monument in O'Connell Street, Dublin, completed after his death by the young Thomas Brock. Langford, Peter. "Burke, Edmund (1729/30-1797)." Oxford Dictionary of National Biography. Online ed. Viewed 27 July 2009. Read, Benedict. Victorian Sculpture. New Haven & London: Yale Univeristy Press, 1982.